Gordo, the English Bulldog that was stolen during a recent Dale Street burglary, has been recovered safe and sound and has been reunited with his owner. He was found wandering loose in the same neighborhood where he was stolen. Detectives suspect that whomever stole him, most likely later abandoned him. The Kingsport Police Department was contacted when the person temporarily caring for him saw on social media that he had been reported stolen. The related burglary investigation is ongoing. On November 23, 2018, a woman reported to the Kingsport Police Department that one of her dogs had been stolen during a burglary to her residence, located in the 800 block of Dale Street in Kingsport. She stated that when she returned home that day at approximately 5:30 PM, she went to let her dogs out of their indoor kennels. She discovered that one of the kennels had been damaged and one of her dogs was missing. She also discovered that a window in the same room as the kennels was standing wide open, which is presumed to be the point of entry for the burglary. 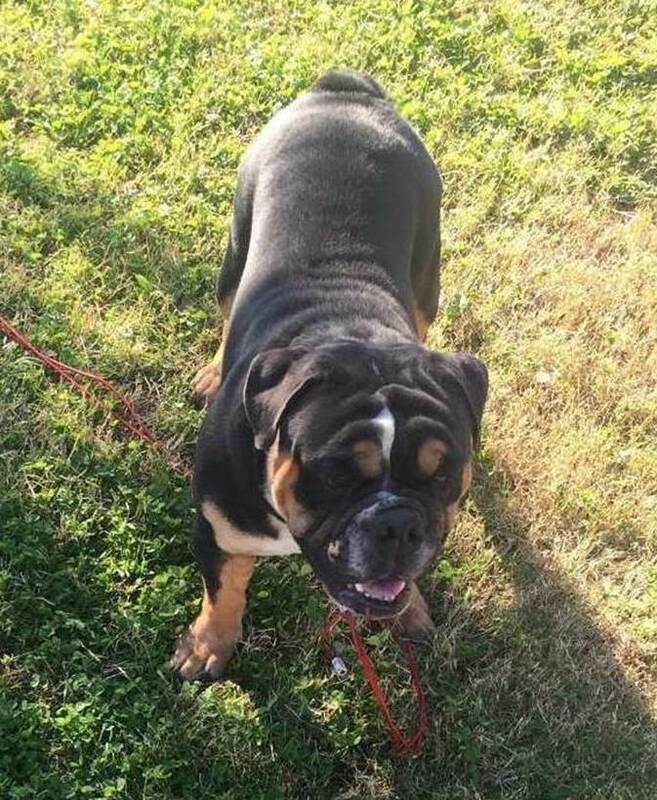 The dog that was stolen during the burglary is a one-year-old black and brown English Bulldog, that answers to the name “Gordo”, with a reported value of $3,500. The black and brown coloration is rare for this breed, so there are not likely many (if any) others like it in the area. The dog was wearing a platinum chain collar. A photograph of Gordo has been included in this release. A neighbor reported seeing a male and female couple with a dog that closely resembled Gordo behind a nearby apartment complex at approximately 4:30 PM that day. The male suspect was described as young, white, and slim, wearing a gray hooded sweatshirt, a white t-shirt, and blue jeans. The only description provided of the female suspect was that’s she had long brown hair. Anyone with any information to help locate Gordo or potentially identify the suspects in this burglary is asked to contact Detectives in the K.P.D. Criminal Investigations Division at 423-229-9429 or call Kingsport Central Dispatch at 423-246-9111.